Is Reflexology the same as Massage, Acupuncture, Acupressure or Shiatsu? Reflexology is not the same as massage, which involves tissue and muscle therapy to promote relaxation. Acupuncture, Acupressure and Shiatsu are similar in some respects to reflexology in their use of reflexes or meridians of the body as they relate to the gland, organs and parts of the body, however Reflexology focuses on relaxation of those reflexes through manipulation to reduce stress and tension. The other therapies are based on the belief that 'Chi' or energy flows through the meridians and that the therapy improves the flow of 'Chi' by reducing or eliminating blockages. No. 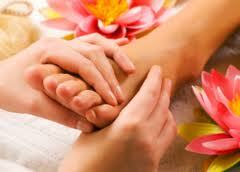 Reflexology is a non-invasive natural therapy that relaxes the body and is essentially harmless. On rare occasions, release of toxins as a result of the body's natural healing process may result in symptoms such as perspiration, nausea or headaches, however these symptoms are not directly related to Reflexology, and are temporary and not serious. What medically diagnosed problems are you dealing with? Many, for example: A blocked lymphatic system, back or neck pain, anxiety, stress, imbalance in the body, constipation, asthma, depression, etc. Reflexology is a complementary therapy that will stimulate the body’s own healing processes and help you to return to a state of balance and well being. Can I have reflexology when I’m having my period? Yes you can as reflexology affects the feet and calves and not the other parts of the body. Any special recommendations after the treatment? After the treatment, you will be so relaxed and without tension. We recommend you drink plenty of water following the treatment as it facilities elimination of toxins and assists the body in healing. Is reflexology a good career? Reflexology is quickly gaining in world-wide recognition as an excellent way towards providing and maintaining health care for all ages. A good reflexologist has sensitive and strong hands. Personal cleanliness and a professional outlook are important. For those who choose self-employment, good business sense is essential. Remember, it takes time and persistence to develop professional skills and a successful practice. This profession is best suited to those who are committed to helping people, and who are able to sustain a challenging work routine.